(Five Seven Music) GO! Get this now! As summer winds down to the last few weeks some of us will be searching for one last big bang via the beach, a back yard BBQ, or a booze fest in your bikini. Well, because I like to help those in need of a soundtrack to accomplish this vitally important task for the year I’m going to let you in on the latest album by The Dirty Heads called Cabin By The Sea. The title is self-explanatory of what you’ll hear - 16 tracks of tasteful reggae jams that are a fine match for your last summer day ventures. Let’s not forget to mention that they were pretty capable last summer of producing a number one hit. Remember? It was called “Lay me Down” and was on every radio station within range of some kind of radio waves. And, if you ask me it’s still a great tune for summer activities. Still not convinced? 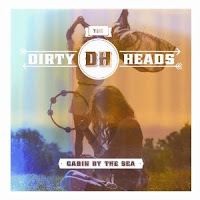 Take a listen below to hear some of the Dirty Heads collaborate with Daryl Hall (from Hall & Oates) on Daryl’s “Live From Daryl’s House”.